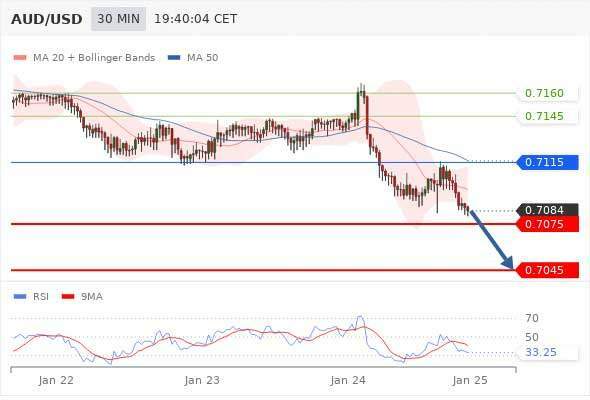 Read daily market analysis, Fx news, Forex tips and technical analysis of US Dollar, Euro, Japanese Yen, British Pound Sterling, Swiss Franc, Canadian Dollar and Australian Dollar of 25th January 2019. Our preference is for short positions below 1.1335 with targets at 1.1270 & 1.1250 in extension. Alternative scenario is above 1.1335 look for further upside with 1.1350 & 1.1370 as targets. Our preference is for short positions below 1.3060 with targets at 1.3010 & 1.2975 in extension. Alternative scenario is above 1.3060 look for further upside with 1.3095 & 1.3120 as targets. Our preference is for long positions above 0.9950 with targets at 0.9990 & 1.0000 in extension. Alternative scenario is below 0.9950 look for further downside with 0.9930 & 0.9910 as targets. Our preference is for long positions above 109.40 with targets at 109.80 & 110.00 in extension. Alternative scenario is below 109.40 look for further downside with 109.30 & 109.10 as targets. Our preference is for long positions above 1.3330 with targets at 1.3375 & 1.3390 in extension. Alternative scenario is below 1.3330 look for further downside with 1.3305 & 1.3280 as targets. Our preference is for short positions below 0.7115 with targets at 0.7075 & 0.7045 in extension. Alternative scenario is above 0.7115 look for further upside with 0.7145 & 0.7160 as targets.